The state funeral procession is held on April 11, 1948. A state funeral for Myanmar independence hero General Aung San and eight of his colleagues was held on this day 71 years ago. Their bodies had lain in state for more than eight months at the Jubilee Hall in downtown Yangon after their assassination on July 19, 1947. The bodies were entombed at the current site of the Martyrs’ Mausoleum near Shwedagon Pagoda. More than 300,000 mourners from all walks of life showed up at the funeral to pay their final respects. When the bodies were placed in the hall after the assassinations, people from across the country headed to Yangon to mourn the slain leaders. A 7 p.m.-5 a.m. nighttime curfew was imposed in the vicinity lest the remains be snatched. 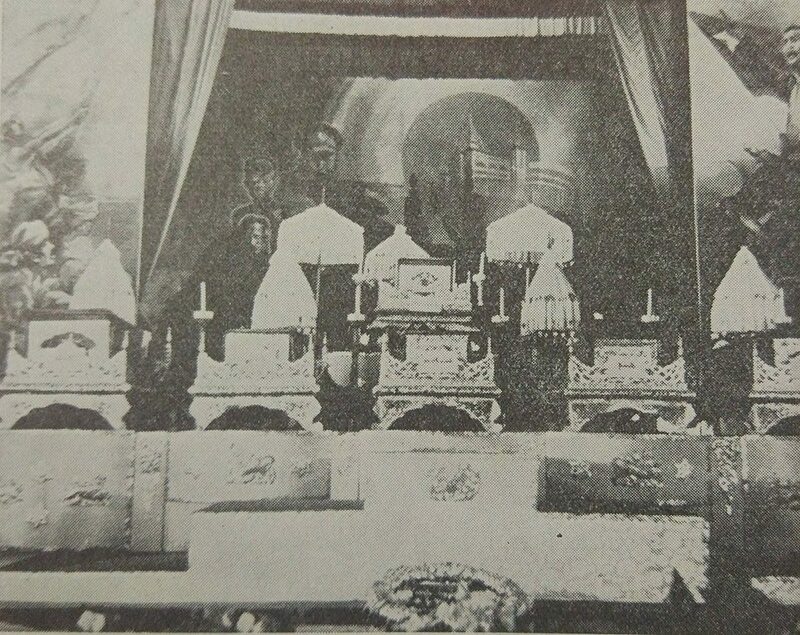 Gen. Aung San and his colleagues lie in state at the Jubilee Hall in Yangon. On the morning of the funeral day, then Myanmar President Sao Shwe Thaik and the bereaved families made donations to Buddhist monks in remembrance of the dead. In the afternoon, volunteers wearing black armbands gathered at Jubilee Hall for the funeral procession, while mourners lined Shwedagon Pagoda Road to pay their final respects. At the burial site, then Prime Minister U Nu delivered the eulogy and four Myanmar Air Force planes scattered flowers over the area. Foreign diplomats and military attachés and representatives of international organizations laid wreaths. The event concluded with the singing of the national anthem in the evening. It was also a busy day for medics, as many people fainted during the procession.